The Catalog Explorer is the central viewer for the Relational Model Data in your LLBLGen Pro project and the entrance point for performing actions on these elements. LLBLGen Pro has a catalog explorer which is multi-selection aware and offers a rich feature set per node through context menus. It's a very important part of the designer especially for users who want to work database-first. This viewer is read-only and gives a more detailed view on various elements available in the Catalog Explorer, like type details of entity fields. Once the Catalog Details Viewer is open, clicking on a node in the catalog explorer will show its details in the viewer pane. At the top of the Catalog Explorer a search box is present which allows you to search on every node in the tree by typing a part of the name of the node. All nodes which name contains the typed text are shown, the rest of the nodes are hidden. Removing the typed text by clicking the X button in the search text box will restore the tree as it was before the search. 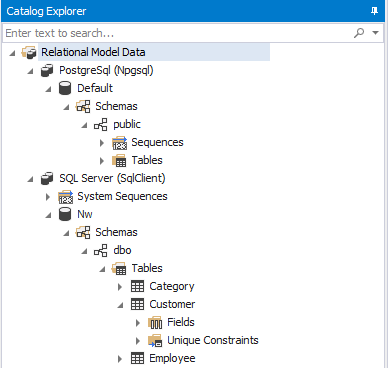 This root node, which is also available in the Project Explorer, is the central hub for Relational Model Data oriented functionality like adding relational model data from a database, or adding a new Relational Data Storage container for a database. Relational Model data, be it relational model data retrieved from a relational database (database first) or generated by the designer from entity definitions (model first), is stored in Relational Model Data Storage containers, which are visible below the Relational Model Data node. Every populated catalog is represented by a node right below the Relational Data Storage container node it belongs to. Several databases support multiple catalogs per project. If the database doesn't support the catalog concept (like Oracle), the 'Default' catalog is used as a place holder. There are two kinds of sequences: sequences stored inside a schema (like Oracle and PostgreSql use) and system sequences which are not placed inside a schema but are available through the used RDBMS, like in SQL Server. Every node in the Catalog Explorer, if applicable, has a context menu which offers functionality on that node or a group of selected nodes of that same type (e.g. a selected set of table definition nodes). The Catalog Explorer is the starting point for when you want to reverse engineer for example entity definitions from elements found in the Relational Model Data: select the elements you want to reverse engineer and right-click the elements to bring up the context menu to select the element type you want to reverse engineer the elements into. You can also right-click for example a Schema or a Catalog to bulk-reverse engineer all elements contained in these containers. All reverse engineering activity uses the Reverse Engineering Element Editor to select the elements to reverse engineer, so it's not necessary to select all tables and all views in a catalog or schema first to reverse engineer them all.